I’ve been playing around with the new RTTI stuff in the D2010 trial, and I have to say, I’m impressed. But for what it surfaces for method pointers (= event types) and sets, it seems both very complete and very intuitive to use. Not only have I managed to use it without having reference to either source code or an API reference (though let’s not encourage Embarcadero on the latter, eh? ), but it has been generally very solid — do something wrong, and an appropriate exception is cleanly raised with a message that tells you straighaway what the issue is. The one (er) exception to this is TValue not doing quite enough verification when attempting a cast to a Variant, though as the latter is an explicit operation, it’s easy enough to work around if and when it bites. That said, reading the small amount of documentation, I happened across mention of an Invoke method, which set me thinking — is it finally possible to cleanly (and generically!) 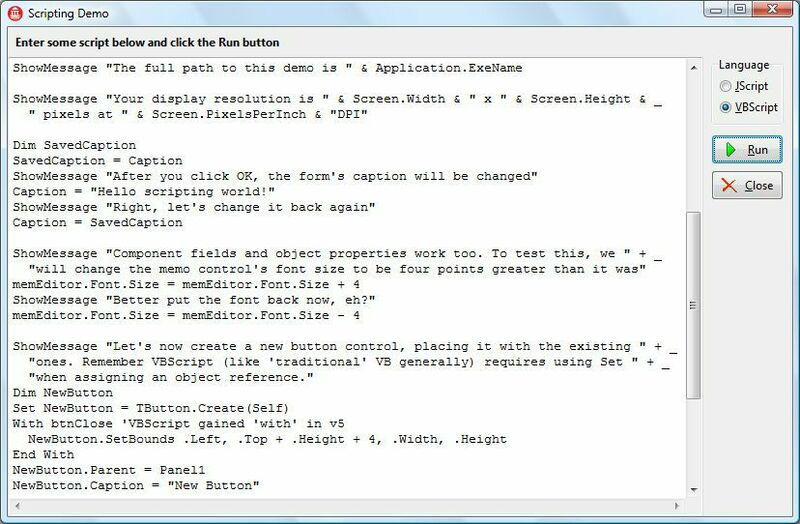 wrap Delphi objects into IDispatch ones for use in Active Scripting? Well, apart from the events issue and the difficulties of surfacing set types in a script-friendly manner, my answer is: for sure! Check out this compiled EXE if you’re interested (screenshot here). Basically, what I’ve done is to write a TCustomDispProxy class with TObjectDispProxy and TClassDispProxy descendants; in the demo, these are then used to directly surface the Application, Mouse and Screen objects, together with the form instance (object properties and fields are handled automatically) and some metaclasses (TButton, TLabel, etc. ).The idea is that no specific object or class type requires a specific wrapper — all just use TObjectDispProxy and TClassDispProxy respectively, with wrappers for sub-objects created on the fly. Now unlike Allen Bauer, I’m not a masochist in these things, and so have used the MS Script Control rather than implemented the Active Scripting interfaces directly; because of this, be warned that if the control isn’t installed (which is unlikely these days, though could be the case), the EXE won’t run. Anything that adds the possibility of scripting to the IDE system itself would be an interesting read. really is creating a native TButton and assigning the form as its owner. Thanks for the article, I will join other with interest! I would love to see the code. It’s been up for months. In fact, I updated the post to reflect this months ago – see the link at the end.